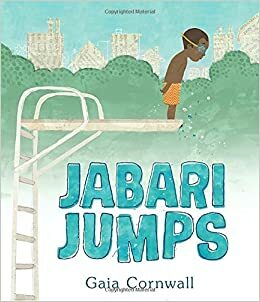 Summary: Jabari is full of bravado as he approaches the pool with his father and little sister, informing them that he will be jumping off the diving board today. “I’m a great jumper,” Jabari tells them, “so I’m not scared at all.” But when he gets to the bottom of the ladder, he has to think about what kind of special jump he’s going to do. Then he realizes he’s forgotten his stretching exercises! Finally, his dad tells him it’s okay to be scared and gives him some advice about how to handle it. Take a deep breath and tell yourself you’re ready. “Sometimes it stops feeling scary and feels a little like a surprise,” Dad says. Jabari loves surprises! He climbs the ladder, walks to the end of the board, takes a deep breath, and splash! He makes a truly spectacular jump. 32 pages; ages 4-8. Pros: A great choice for summer reading, short but funny, with a bit of a lesson subtly inserted. The illustrations perfectly capture the feelings of the pool and the diving board. Cons: I wish I had reviewed this when it first came out in May. Feels like those days at the pool are numbered.